My outfielders are Jason Heyward, Michael Morse, Colby Rasmus, and Domonic Brown. Who do I try and trade away? It’s a competitive, deep 12-team league. I need to trade oneÂ or two away with Ryan Braun coming off the DLÂ TuesdayÂ or I drop one of them and he gets picked up immediately. Note that one of the OF spots is CF specific, 2 other OF and no UTIL. – Heyward is projected to have the best year, and if sold now I’d be selling him for much less than I drafted him for. I drafted him since it’s kind of his live or die year, and players tend to excel around that time, and he should be a top 10 CF by the end of the year no? – Morse could have another great year like 2009-20011, where he had 17 AB/HR and .300ish average. His .540 SLG is right on his 2011 30+ HR year. Could this be a throwback year? – Colby Rasmus could finally be playing up to his potential as a first round pick by the Cards. Again I need a CF position specifically, Â and he has potential to be kind of a Pedro Alvarezy all pop-swing away types. Plus the Jays lineup is killing it, so more pitches to hit and more plate appearances facing the bullpen. I know 5 HR 8R 12 RBI in the last 10 games isn’t a pace that can be kept up, but could his be a sign of what the rest of his year looks like? – Brown can’t hit anything outside, but if he could figure it out, and he had a much better 2013 than either of the other 3. Now that pitchers found a hole in his swing, do you think he can adjust? I know he hit all those homers the first half of last year pretty short. He had the shortest average homerun distance, and they were always to right field. Will he ever live up to last year? Who do I target? Anyone I should go for specifically? Do I try to pair a couple up and trade up / a trade they can’t refuse? You’ve written the analysis yourself, I agree with almost all that you’ve said. But let’s look at a few data points. 2014 Cost: Heyward 23, Morse 13, Rasmus 14, Brown 23. You have a different scoring system than either the 5×5 costs and earnings above, or the ESPN Rater, but we can see that in any system Morse and Rasmus are exceeding expectations and Heyward and Brown are lagging. Which is why you’re asking the question. I have to admit, I find the slumps of Heyward and Brown disturbing. Heyward because it has gone on so long, Brown because it looked like he’d made real strides last year, and hasn’t looked like the same hitter this year. If the pitchers have found a real hole, and he can’t adjust, he’s going to have a problem. But when I look at the numbers, the player I think you have to ditch is Michael Morse. He’s walking less than ever before, striking out more, hitting more infield flies (that’s bad), hitting a lot of his fly balls for homers. All of these are suggestive of a coming correction, an end to his hot start and a slump of sizable proportions. But here’s the good news. Morse is probably your most tradeable player. His numbers don’t compare horribly to 2011 (he didn’t walk much then either). You might convince someone that he’s going to keep this up. Maybe even package him with Brown, to create a roster slot for the guy you get back to fill. It’s worth trying, anyway, and probably worth it for a team doing poorly to take some chances. The other good news is that you’re getting Ryan Braun back. In a shallow league like yours, where only 36 outfielders play at a time,Â having sure Top 10 guys really helps. 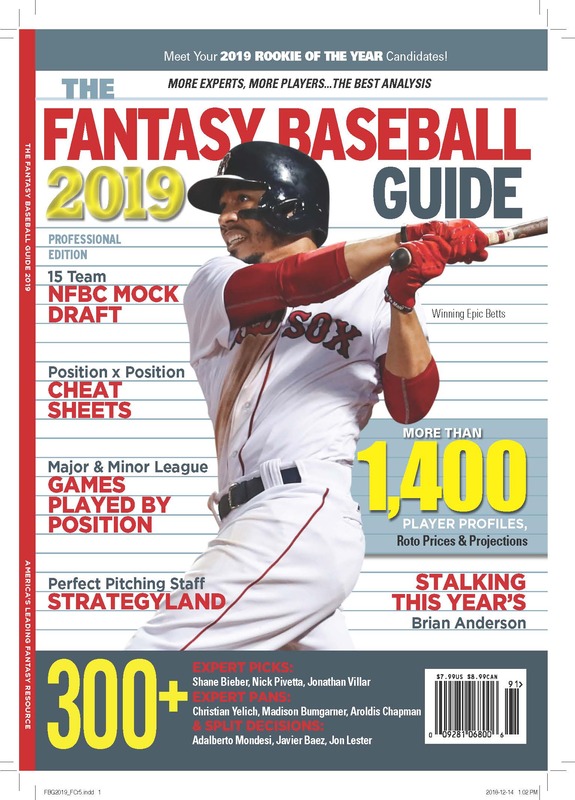 Bolick’s Guide to Fantasy Baseball Prospects 2014 on sale at Google Play store, now!